Last night was a tough night. I got about 2 hours sleep before the ship started rocking, then tossed and turned until we stopped to pick up the river pilot about 4 AM. Then I only slept again until first light crept in around the curtains. I really wanted to see our passage up the Saigon River, so I got up at 5:30AM, through on a caftan, grabbed my camera and went out on the balcony. The sky was beautiful. I stayed out there and videoed the sunrise, fishing boats starting out, and the coastline. I was surprised to see how flat the land is and how the trees and brush is growing right up to the water line. The river isn't that wide, so I am really surprised it is deep enough in the center for a cruise ship. The slow trip up river took several hours. We docked about 8:30AM. Our tour was not scheduled to leave until 1PM, so we went to breakfast, then came back to the room and took a nap. Our tour was called "Highlights of Saigon" and it was really good. We began with a bus ride to the Vietnam History Museum. There were artifacts dating back thousands of years. Vietnam has a complicated history and has been invaded by China several times. 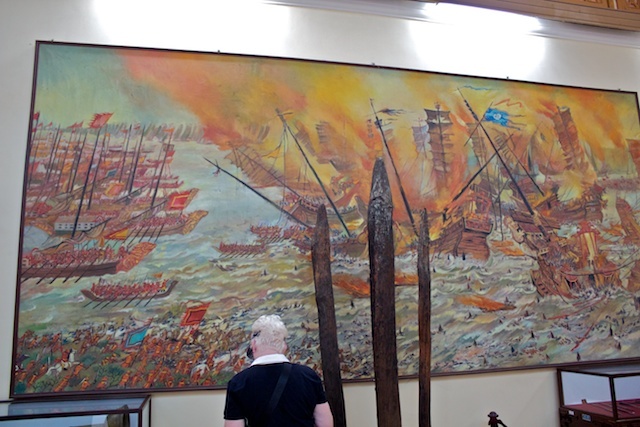 Vietnamese generals defeated invading ships twice over the centuries by placing spikes in the harbor to disable incoming ships. At the end of the museum we got to attend a water puppet show. This is an art form unique to Vietnam. Puppeteers stand in the water behind the curtain and control the puppets with long sticks. This was a lot of fun. Next we went to "The Independence Palace Historical Relic", the building that was the former South Vietnam Parliament building. For those who remember the end of the Vietnam war, this was where the North Vietnamese tank crashed through the front gate within days of the U.S. withdrawal from Saigon. The building is maintained as a museum. We visited a large assembly room and 2 large conference rooms before going down to the basement. This area contains many rooms used as tactical control during the war. Old radios, typewriters, etc. from 40 years ago remain on display. Our next stop was a photo stop at the post office and the Catholic Cathedral of Notre Dame. 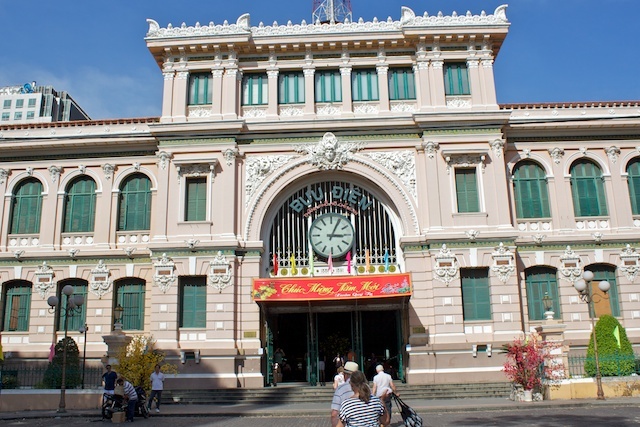 The Saigon Post Office is an amazing building. The entrance leads to a huge central hall with a cathedral ceiling, old style wooden phone booths on either side of the entrance, and a large photo of Ho Chi Minh at the far end. The Cathedral of Notre Dame is across the street from the post office. 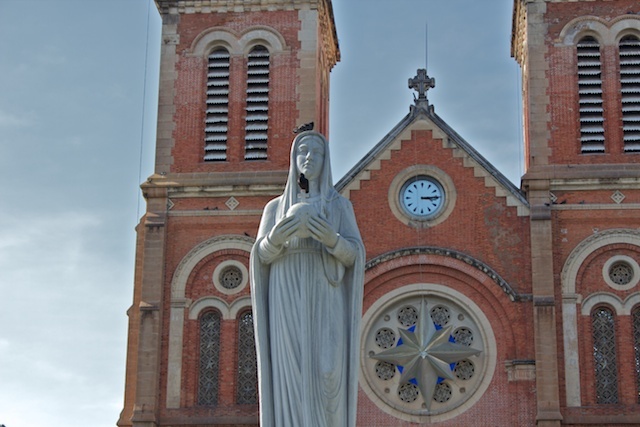 I understand that this is the seat of the Catholic diocese of Vietnam. We made 3 other stops after that. One was to a Lacquer shop. Artists were working in an open hall in the entrance and a guide explained how lacquered items are made there. Of course there was a visit to their shop after the explanation. There was a wonderful collection of art, plates, boxes, furniture and other items. We picked up 2 small flower vases as souvenirs. 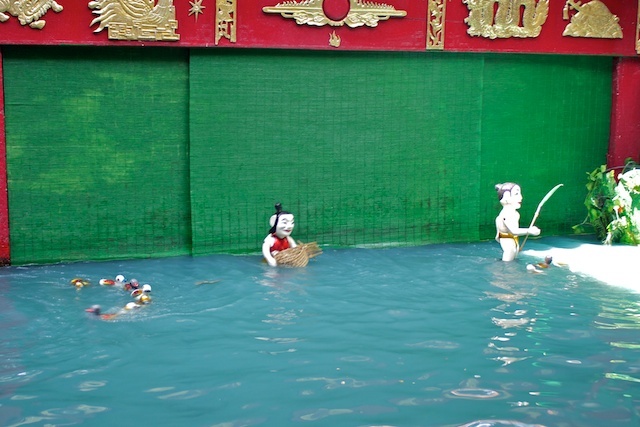 The next stop was in Chinatown to visit a 200 year old "Sea Goddess Temple." 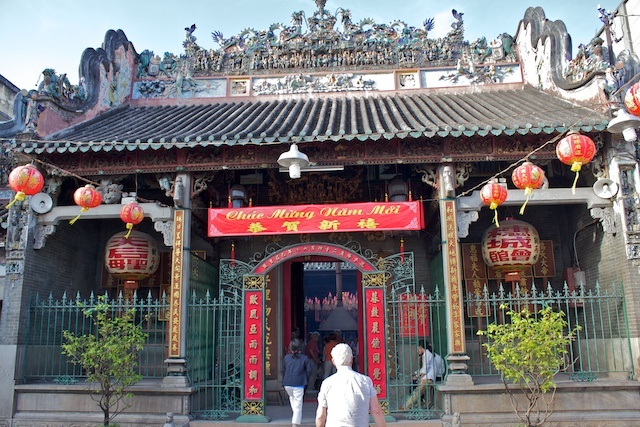 Our guide said that the Chinese immigrants to Saigon originally came by boat, so they erected this temple to thank the goddess for their safe voyage. The last stop was to visit the local food market. Ray and I decided not to get off the bus at this stop. I wasn't interested and Ray had no desire to be reminded of what Vietnamese food is like. From comments we heard from people getting back on the bus, we made the right decision. Our guide for today was very good. He gave a fairly balanced and sensitive narative of Vietnam's history. Ray did very well today too. He was a bit apprehensive of his first time stepping on Vietnamese soil in 40 years. He did not spend any time in Saigon when he was here, so he doesn't have a real point of reference for what it was like during the war. That will be different when we get to Da Nang. I'm glad our first stop was Saigon. Overall impression - Saigon is on it's way to recovery, but still has a long way to go. There are lots of new buildings and bridges, and some industry is coming into the city, but there is still a lot of poverty. Our guide said there is zero unemployment because if you don't do something you don't survive, but jobs like selling vegetables or lottery tickets on the street don't seem like enough to sustain life. Much of the infrastructure is still either from the early 1900's or non-existent. It sounds like the most progress has been made in the past 10 years. We made it back to the ship just in time to change for dinner. 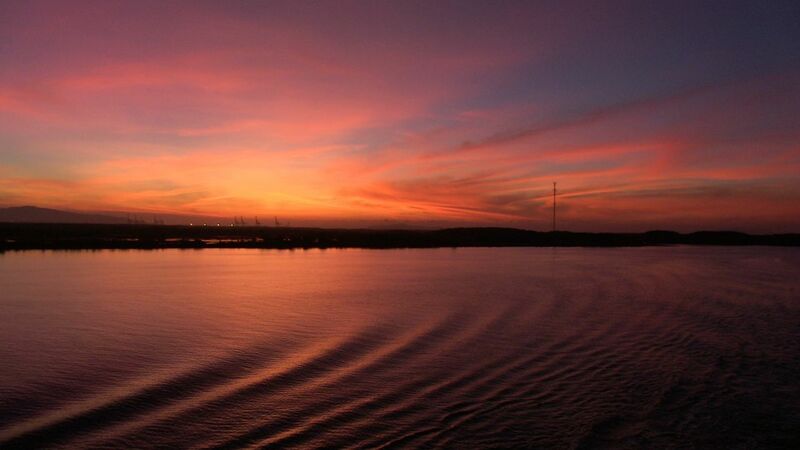 The ship stays in port tonight so we are looking forward to a good night's sleep.